Tectonic Pate » Is this chicken pox? Tabby has become a medical mystery. 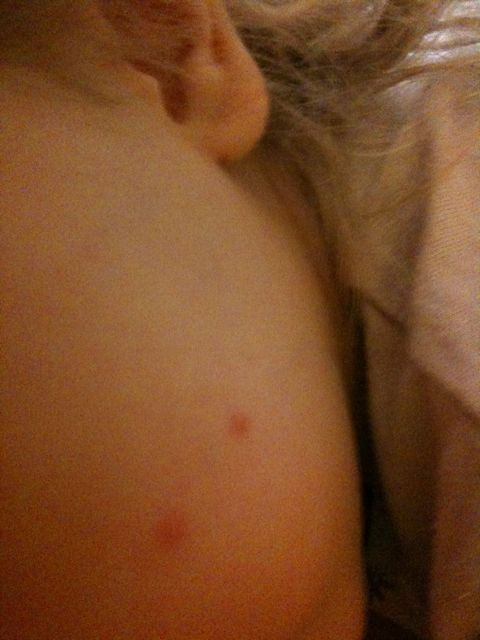 There’s an outbreak of chicken pox at her nursery, and she’s covered in spots. The thing is, she’s had chicken pox twice already – a mild outbreak as a baby, and then a proper dose less than a year ago with all the flu and the scratching. For the last three days half a dozen or so chicken pox-like spots have flared up on her face, but none have erupted in poxy blisters, like what the chicken pox do. And there’s only a few of them. The question is, is this chicken pox? The doctor looked and said they’re definitely not bites (the cat was in a cattery a week ago while we were on holiday), but at the same time they don’t seem to be virulent enough to be chicken pox… Still, my inclination is that if it looks like pox and there’s pox around, then it’s probably pox. Even if some people argue that that’s medically impossible. Whatever it is, it’s probably innocuous. The problem being that if it’s chicken pox she can’t go to nursery and has to stay home, in which case I can’t carry on cutting my way through the backlog of work from the holiday. At least I haven’t succumbed to thoughts of “well, if it’s not chicken pox, maybe it’s… something… worse…” Yet. Reading about your thoughts around Tab’s chickenpox I thought to share my experience with you. I officially had traditional chickenpox twice – First time (at age 9) it was full blown the second time (age 21) it looked like Tab’s spots and then there was a THIRD encounter (where I was exposed at age 23 and I got flu-like symptoms and pox-like sores in my mouth, nose etc). The doctors also couldn’t believe it as it is very rare. I was told by the one SA doctor that I am susceptible to shingles (a strain which is family of the chickenpox virus) because of having multiple chickenpox breakouts. I manage shingles with vitamins and good nutrition and I’ve only had it once back in 05. I’m not saying Tab is going to get shingles but that I believe YOU could be right!